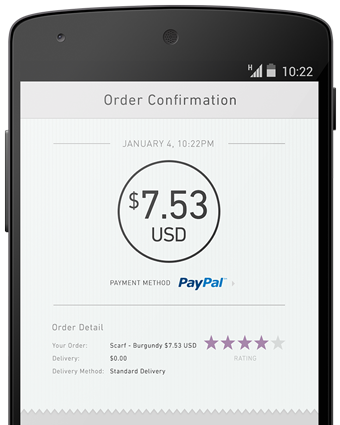 PayPal is accepted on millions of mobile sites, just like it is on your computer. It's the safer and simpler way to pay on the go. Log in with an email address and password and check out in seconds. Shop wherever you are, on mobile sites. All of the deals, none of the queues. Shop on the go, pay on your smartphone and tablet just like on your computer. Put your cards in one place. Once you link them to your PayPal account, you can just pay as easily. "Forget wallets, we paid for all three days of the music festival on my phone." When you're away from your computer, you can pay just as easily and even faster with PayPal. And the best part – you don’t have to enter your card details each time you pay. When you’re shopping on your mobile, your eligible purchases are protected, just like on your computer. Pay through PayPal, not through the nose.